Right to Rise, the Super PAC supporting Jeb Bush, has been among the bigger spenders on campaign advertising in New Hampshire so far this year. Turn on the television in New Hampshire these days, and you won’t have to wait long before Jeb Bush, John Kasich or Chris Christie pops up on your screen. Super PACS backing the three Republican presidential candidates have already spent millions on ads targeting Granite State voters. But look at the polls and you’ll have to work a bit harder to find them. All three are well behind a candidate who hasn’t appeared in a single political ad in New Hampshire – Donald Trump. According to documents filed with the Federal Communications Commission, by the end of this month, network broadcasters that reach New Hampshire voters will have aired an estimated $16.3 million in primary–related ads. Almost 70 percent of that airtime - totaling just under $11 million - was reserved by independent groups, mostly Super PACs, that support Bush, Kasich and Christie. Meanwhile, Bush is the only one of the three who cracked single digits in the latest poll of Republican primary voters. The Bloomberg Politics/St. Anselm College survey, released Wednesday morning, put Bush’s support at 10 percent, 14 points behind Trump; Kasich (7 percent) and Christie (5 percent) have even more ground to make up. Whether more ads are the answer is debatable, but that seems to be the plan, at least for now. Right to Rise, the super PAC supporting Bush, has contracted for at least another $3.8 million in network ad time through New Hampshire Primary day (tentatively scheduled for Feb. 9). More than $2 million has been reserved by America Leads, which backs Christie; and two PACs supporting Kasich are planning to spend another $1.4 million. And then there is Ben Carson. At 17 percent, the former pediatric neurosurgeon is second in New Hampshire behind Trump in the Bloomberg/St. Anselm poll, and last week, he reported raising $21 million in the third quarter, more than any other Republican candidate. Yet Carson has spent less than $142,000 on ads in the state, and has no air time reserved beyond the first week in November. That’s about the time Marco Rubio and his backers will begin advertising in earnest. Rubio's campaign, a super PAC, Conservative Solutions and a 501(c)3 , the Conservative Solutions Project,* plan to spend close to $5 million on ads right up to primary day. While more competitive and much less cluttered, the Democratic side reveals a similar dynamic. Hillary Clinton, who trailed Bernie Sanders in New Hampshire until this week’s WBUR poll put her four points ahead, is the only Democrat in the race to run TV ads in the Granite State. Her campaign has spent nearly $3 million so far, with another $500,000 in air time reserved through the end of the year. Clinton also has the support of a super PAC, but her campaign has been footing the advertising bills. Because federal election law limits what broadcasters can charge candidates for air time, Clinton is getting more for her money. This week, for instance, Clinton has scheduled 213 ads on four network stations that reach Granite Staters, according to FCC filings. She’ll pay an estimated $167,000, or roughly $785 per spot. Meanwhile, New Day for America and New Day Independent Media – the super PACs supporting John Kasich – plan to run 66 ads this week, for which they will pay around $262,000. That works out to almost $4,000 per 30-second spot, more than five times the rate paid by the Clinton campaign. 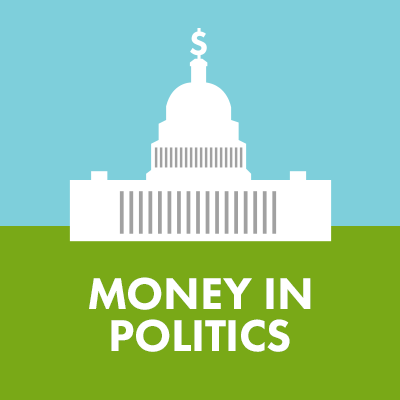 Super PACs, which have dominated local advertising so far, may not be getting much bang for their buck, but the broadcasters are, especially WMUR. New Hampshire’s only statewide television station is projected to take in $2 of every $3 spent on primary-related ads through October, or $10.7 million. Note: This post was amended to include the nonprofit Conservative Solutions Project to the independent groups that have reserved ad time to support Marco Rubio. Mapping the Money: How Much are N.H. Voters Giving to 2016 Candidates? Republican donors in New Hampshire are beginning to loosen their purse strings for their party’s primary contenders. 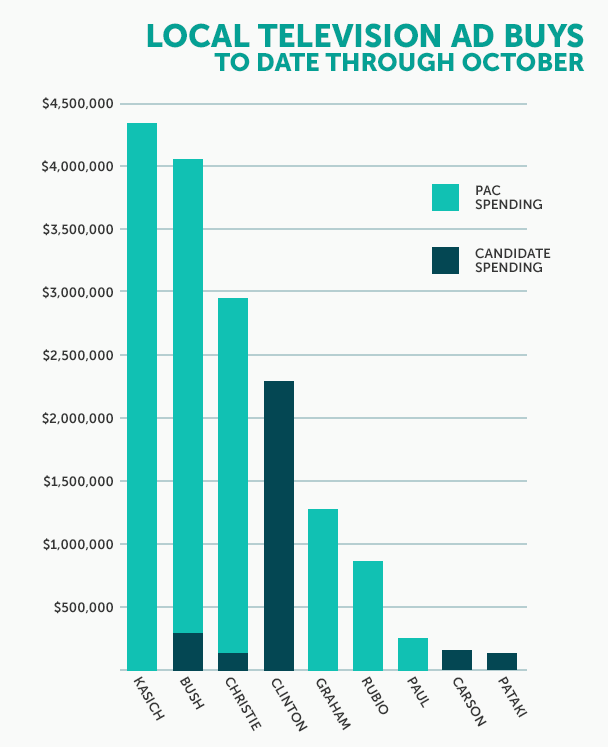 Granite Staters contributed more than $220,000 to GOP presidential candidates in the third quarter of 2015. That’s $70,000 more than Democrats took in, and a big change from earlier in the year, when Republican candidates were out-raised in New Hampshire by a two-to-one margin.